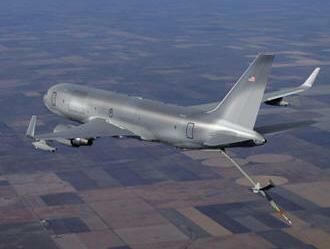 March 5, 2010 - The Boeing Company announced that it will offer the Boeing NewGen Tanker in the competition to supply the U.S. Air Force with a multi-mission aerial refueling aircraft that will meet all the warfighter’s mission requirements for the next several decades. Dennis Muilenburg, president and CEO of Boeing Defense, Space & Security, said the Boeing NewGen Tanker will satisfy all mandatory Air Force requirements and offer an American-made tanker that will be capable, survivable, and combat-ready at the lowest cost to the taxpayer. “Having supplied tankers to the Air Force for the past 60 years, Boeing has drawn on its unmatched aerial-refueling experience to thoroughly review and evaluate the KC-X solicitation issued by the Air Force,” Muilenburg said. • A digital flight deck featuring electronic displays taken directly from the most advanced commercial airliner in existence -- the Boeing 787 Dreamliner -- that show all flight attitude, navigation, engine indication and crew-alerting information on screens 75 percent larger than on a commercial Airbus A330. • A new-generation fly-by-wire boom with an expanded refueling envelope and increased fuel offload rate. It will meet the Air Force requirement and simplify refueling operations to reduce workload for the aircrew and improve safety and reliability. Boeing is the only team in the KC-X competition that has invented, manufactured and delivered combat-tested aerial refueling booms. • The Boeing NewGen Tanker will be controlled by the aircrew, which has unrestricted access to the full flight envelope for threat avoidance at any time, rather than allowing computer software to limit combat maneuverability. The NewGen Tanker will meet all of the Air Force’s 372 requirements -- including a production rate at whatever level the Air Force determines -- with a low-risk approach to manufacturing that relies on existing Boeing facilities in Washington state and Kansas as well as U.S. suppliers throughout the nation, with decades of experience delivering dependable military tanker and derivative aircraft. More cost-effective to own and operate than the larger, heavier Airbus airplane, the Boeing NewGen Tanker will save American taxpayers more than $10 billion in fuel costs over its 40-year service life because it burns 24 percent less fuel. The Boeing NewGen Tanker program also will support substantially more jobs in the United States than an Airbus A330 tanker that is designed and largely manufactured in Europe. Boeing has been designing, building, modifying and supporting tankers for decades. Those tankers include the KC-135 that will be replaced in the KC-X competition, and the KC-10 fleet. The company also has delivered four KC-767Js to the Japan Air Self-Defense Force and is on contract to deliver four KC-767s to the Italian Air Force. Three of the four Italian tankers are in flight test, with the fourth airplane in production. The Air Force released its final KC-X Request for Proposal on Feb. 24. Boeing will deliver its proposal by May 10, within the 75-day period set forth in the terms of the solicitation. The Air Force is expected to announce its decision later this year.